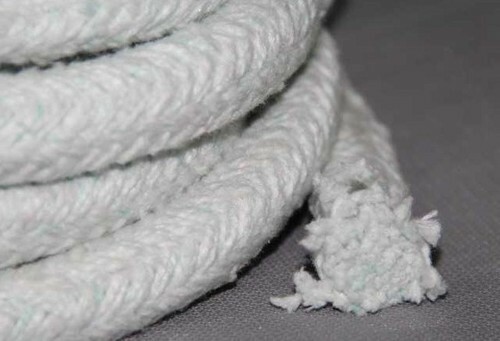 Ceramic Fibre Ropes are reinforced with SS Fibres to ensure heavy duty and long life.Ropes are available in various sizes & density as per buyer's demand. Ceramic Ropes are excellent in the application for furnace door sealing, wire/cable insulation, as gaskets etc. Backed by vast industry experience of years, we hold immense expertise in offering refractory items in South India. Our range includes ceramic fiber products, bulk fibre, and wool blankets, cerachem blankets, veneering modules, moist felt, ceramic paper, veneering cement, fire bricks, fire insulating bricks, low cement castables bricks, blast furnace and stove bricks, bricks for glass industries, alumina bricks, high alumina bricks, low iron alumina bricks, refractory castables, conventional refractory castables, cement castables, hysil block, ceramic fiber paper, ceramic fiber board, ceramic wools, fire clays, fire bricks. Our product range is superior in quality and finds application in the glass, cement, chemicals and many other industries. Furthermore, our organization undertakes and executes turnkey projects to construct furnaces for heat treatment, forging and aluminium processing plants. We also help our clients to save energy by undertaking furnace revamping and modification works for them. Owing to the superior quality of our products and services, we have earned immense market appreciation. In these years, we have expanded our client base and acquired many reputed clients from different sectors.